Specialising in mid to high-end bathroom renovations, the family-run Victorian Bathroom Company has the expertise to create a bathroom that’s perfect for Peninsula living. The highly skilled team know that your bathroom must be practical yet reflect your style, your personality, wake you up and relax you. With all these conflicting requirements it can be an overwhelming experience knowing where to start. The Victorian Bathroom Company offers a fully comprehensive bathroom renovation service from design right through to completion, and also works with Australian and New Zealand suppliers, including Timberline, Decina and Methven, to ensure exceptional quality and longevity in your bathroom. Industrial (sleek and contemporary greys and concrete textures). Need inspiration? View the portfolio of completed projects at victorianbathroomcompany.com.au or on Instagram @victorian_bathroom_co, and know you can renovate with confidence by choosing the Victorian Bathroom Company, a registered building practitioner and licensed plumber. With a permanently employed team of skilled tradesmen, the full project is completed from start to finish by the same team. Respectful and clean, they will cause minimal disruption to your daily life and leave your house so spotless you’d think they had never been. Ovenu owners Nathan and Kim know you can’t live without a functioning piece of equipment. With the holidays just around the corner, now’s the time to give your oven, range hood, cooktop and barbecue a thorough pre-Easter clean. Ovenu technicians use an exclusive range of fully biodegradable, non-caustic and sustainable products that are completely safe for your family and pets. Fast and friendly, the technicians use a ‘no nasty fumes’ clean with a carbon remover approved by the Vitreous Enamel Association, and they separate the glass panels in your oven door for a transparent, seamless shine. Here’s something to consider: if plastic microbeads had been created at the time of the Big Bang, they’d still be around now — 13.8 billion years later. That’s just one of the startling findings in a study by UK-based packaging supplier Rajapack on the impact single-use plastics are having on our environment. The use of plastic microbeads in ‘rinse-off’ cosmetics has been banned in many countries, including the US, the UK, New Zealand, Canada and France; Australia’s environment ministers agreed in 2016 only to support a voluntary industry phase-out. But those that already exist aren’t going anywhere ever. Microbeads are a microplastic, which describes any plastic fragment less than 5mm in length. Primary microplastics, which include microbeads, are those that have been purposely manufactured for a variety of uses from cosmetics to clothing to industrial. Secondary microplastics are created by the breakdown of larger products, such as plastic bags and bottles, by natural processes such as sunlight exposure. Microplastics have been found everywhere from the Mariana Trench to the human gut. Given they can not only absorb pollutants from their environment but are also often made from toxic and carcinogenic chemicals, that’s food for thought. Rajapack’s study — at rajapack.co.uk/swimming_in_plastic.html — estimates that 4.8-12.7 million tonnes of plastic enter our oceans each year, adding to the more than five trillion pieces of plastic polluting the marine environment. While this global problem might seem far beyond our control as individuals, there are many simple things each of us can do to help eliminate single-use plastics that don’t require a massive lifestyle change. Rajapack has isolated three: straws, cups and scrubs. A single plastic straw can take 200 years to biodegrade; a paper straw takes three days. If you really need a straw for your drink, buy a reusable one or find a retailer that uses paper straws. Polystyrene foam cups don’t biodegrade; if they’d been around during the Jurassic era, Rajapack points out, archaeologists would still be digging them up today alongside dinosaur fossils. A cup made from 100 per cent biodegradable material will be gone in three to six months. Better still, find a café that accepts reusable cups and take your own. Finally, manufacturers of exfoliating scrubs might be voluntarily phasing out microbeads, but you can also make your own scrubs and face masks easily and cheaply from such common household ingredients as coconut oil and sugar; olive oil, honey, lemon and sugar; raw oats, honey and olive oil; and baking soda and water. Regular readers of this column will be aware that many Peninsula businesses are trying to eliminate or at least reduce single-use plastics. From paper straws to reusable shopping bags to bring-your-own coffee cups, businesses are stepping up. It’s up to us to do the same. Invest in a reusable water bottle and fill it up at home before you hit the gym or set off on your daily walk. Keep a few reusable shopping bags in the car so you’re not caught short if you decide to duck into the shops on the way home. Keep a cutlery set at work so you can refuse the plastic knife and fork that usually accompanies your takeaway lunch. And those plastic containers your lunch comes in can be cleaned and reused more than once — to store stuff in your fridge, as a pet’s food or water bowl, for the kids to keep their Lego bricks, colouring pencils and crayons and other bits and pieces in or to make things with. There are so many ways we can eliminate single-use plastics from our lives; all it takes is a little forethought and a touch of determination to leave our children and grandchildren a healthier planet Earth. Christmas has come and gone, so now’s the time to give your oven, range hood, cooktop and barbecue a thorough post-festive season clean. Ovenu technicians use an exclusive range of fully biodegradable, non-caustic and sustainable products that are completely safe for your family and pets. Ovenu owners Nathan and Kim know you can’t live without a functioning piece of equipment. That’s why their technicians are fast and reliable and use a ‘no nasty fumes’ clean with a carbon remover approved by the Vitreous Enamel Association. They separate the glass panels in your oven door for a transparent seamless shine too. The Roman Empire is more than just a supplier of beautiful custom-made products for the soft furnishing industry. Its staff members also offer valuable product knowledge that they’ve gained from years of experience and an underlying passion for design. The festive season is the ideal time to get a taste of their style and offerings by getting in before the Christmas rush to guarantee New Year delivery of your window coverings. Embracing the seasonal spirit of giving, they are offering you 20 per cent off until Saturday, December 15, when you mention this editorial. Priding themselves on providing a high standard in everything they do means you’re in the safest of hands. Everything they offer is tried and tested before it goes out to the client. This includes testing their roller blinds and hanging their drapery before installation so that they can ensure the product sits exactly the way it’s supposed to. Selecting the right soft furnishings for your home can be daunting but we spoke to Lloyd Bradshaw, senior sales consultant at The Roman Empire, about his knack of picking the right options for his clients. Go on, the Empire awaits. Two Mornington Peninsula gardens will be featured as part of Garden DesignFest 2018 next month. Flinders’ Musk Cottage garden, designed by Eckersley Garden Architecture, and a garden at Red Hill South designed by Kate Seddon will be open from 10am-5pm over the weekend of November 17-18, with their designers represented on site. Musk Cottage has been a pet project of Rick Eckersley and his design team for several years. Originally, it was laid out as a trimmed English garden with manicured lawns and a wisteria-draped lattice, but Eckersley Garden Architecture’s thoughts were to create something that was uniquely Australian in flavour. This non-irrigated garden relies on the mulch at its base and the toughness of its plants, and it now stands as a testament to low-maintenance, sustainable gardening. Decorative, remnant walls at the Red Hill property gave rise to a walled garden, creating a whimsical and welcoming entry. A broad deck, fire pit and strategically placed rock platforms create seating areas, while beyond the walled garden, refurbished buildings and meandering paths invite you to wander and explore. Character and whimsy abound in this garden with found objects and repurposed materials. Billed as Australia’s best display of professionally designed gardens, Garden DesignFest is a fundraising event managed by the Rotary Clubs of Kew, Brighton North and Central Melbourne. The main charity to benefit from this year’s event will be End Trachoma by 2020. The downsizer contribution provides an excellent opportunity for anyone aged 65 or over who sell their main residence (your home) held for at least 10 years to contribute up to $300,000 each ($600,000 for a couple) into super. The usual work test and total super balance restrictions do not apply when making a downsizer contribution. Only Contracts of Sales entered into from 1 July 2018 may qualify for a downsizer contribution. · You do not have to actually downsize living accommodation to be eligible and can be moving into Aged Care. · Downsizer Contributions are not tax deductible and may impact Centrelink Age Pension. · Downsizer Contributions converted to a tax free super pension count towards your transfer balance cap. · Downsizer Contributions needs to be made within 90 days of receiving sale proceeds. · Downsizer Contribution amount cannot be greater than total main residence sale proceeds. This is a complex area, so if you (or anyone you know) are looking to downsize your home, contact Michael Stout on 97838077 to discuss the suitability of this strategy. The information (including taxation) above is general advice only and does not constitute personal advice. It has been prepared without taking into account any of your individual objectives, financial solutions or needs. Before acting on this advice you should consider the appropriateness of this advice, having regard for your own objectives, financial situation and needs. You should seek personal financial advice from a qualified financial adviser before acting on the advice. For people considering a move into retirement living, and even those who might not have considered it, the options can be overwhelming. Here are five top tips to ensure you make the right choice. For many people, the thought of leaving the area they’ve known all their life is overwhelming. In fact, many retirement villages are made up of locals who have lived in the area their entire life. If you’re set on staying local, the first step is to find out what villages are nearby. All villages are different, and working out what’s important to you can help narrow down the search. ‘Must haves’ might include a pet-friendly policy, a bowling green or an extra bedroom for the grandkids. Once you’ve got a list of villages to inspect, you can arrange a tour. Lendlease holds weekly ‘Tea and Tour’ events at a number of villages, which provides the opportunity to explore the village in an informal setting. Attending an event is a great way to meet and mingle with current and future residents. Koorootang Court and Martha’s Point are holding an open day from 10am-2pm on Saturday, October 13. So stop by and get a real feel for the village lifestyle on offer. Once you’ve decided on a village, it’s a good idea to book in a one-on-one meeting with the sales manager. They’ll provide you with helpful information about the different ways you can buy and how to make the move. Lendlease has two villages within the Mornington Peninsula: Koorootang Court and Martha’s Point. To view all events, visit retireinvic.com.au or call 1800 550 550. It is amazing what hidden gems are waiting to be discovered in the back streets of the Mornington Industrial Estate. One such gem is Locked in Escape Rooms. Escape room games are the newest trend in entertainment. Teams are pitted against the clock in themed rooms from which they are trying to escape before their time runs out. Teams need to explore the rooms, hunting for hidden items that they can use to aid their escape. Puzzles and brainteasers inside the rooms will reveal further clues, codes or combinations. Locked in Escape Rooms has four different, fantastically themed rooms that immerse players in the story they are a part of. A quick look at Facebook or Trip Advisor shows just how popular and well-reviewed Locked in Escape Rooms is. Consider Locked in Escape Rooms for your next social event or work team-building function. Any time’s a good time to visit Somerville Egg Farm, where family and friends love to gather while buying only the freshest eggs. This winter why not take the time to visit the Napolitinos and their animal friends on an egg farm that connects people with scrumptious Mornington Peninsula produce. Take home the freshest and most delicious eggs with luscious golden yolks to cook up a storm over the cooler months ahead or just say hi to the free-range hens, maremma dogs, alpacas and goats on this family-friendly farm. Winter warming treats have never been so easy to prepare with Somerville Egg Farm eggs. This experienced family of farmers, who represented the Mornington Peninsula on Channel 9’s competitive cooking series Family Food Fight in 2017, offer the best quality eggs at an affordable price, and because you know they care for their chooks you know the quality is top-notch. This is the perfect place to stock up on eggs for all your baking and cooking needs because Luigi and Maria Napolitano have been supplying eggs to the Peninsula since 1978 and love what they do. They now share the running of their farm with son Anthony and daughters Linda and Anita, who continue the Napolitano tradition with flair. Get cracking and purchase some of Somerville Egg Farm’s very fresh eggs this winter while enjoying some downtime with family and friends on the magical Mornington Peninsula. Fresh air and fresh produce provide the perfect winter weekend escape, then head back home to bake and taste. If your cooking appliances are in need of some extra care over the cooler months, Ovenu Mornington Peninsula is the expert at reviving and restoring your oven, range hood, cooktop and barbecue to near-perfect showroom condition. Ovenu technicians use an exclusive range of biodegradable, non-toxic, non-caustic products that are completely safe for your oven, family and pets too so you can enjoy creating sumptuous meals and treats with near-new appliances free of nasty chemicals. Ovenu owners Nathan and Kim realise that you can’t live without a fresh and functioning piece of equipment. That’s why Ovenu technicians are fast, reliable and professional. They can even separate the glass panels in your oven door for a seamless transparent shine you simply won’t believe and ensure real peace of mind that your food is being prepared on or in an appliance that’s 100 per cent safe for you. Kiss your holiday season residue goodbye or simply give your appliance the mini makeover it deserves by calling Ovenu on 1300 683 681 for a quote. You and your family will be glad you did. Don’t lose money through your windows and doors. Choose Enertec Window & Door Systems and save! Cut down your utility bills and keep your home cooler in the summer and warmer in the winter with Enertec windows and doors. Using the latest in German technology, Enertec manufactures high-quality uPVC double-glazed windows and doors to suit every style. Get added safety and security for your peace of mind with a sophisticated locking mechanism and reinforced steel structure in all Enertec windows and doors. They are virtually maintenance-free, environmentally sustainable, renewable, and recyclable. The 10-year warranty and affordable price tag makes Enertec windows and doors the obvious choice for savvy shoppers. Check out the Enertec range online or drop by the showroom. Mention Mornington Peninsula Magazine when you call for your free measure and quote to receive your 10% discount. If your cooking appliances are in need of a hearty post-Christmas clean to restore their sparkle and performance for the year ahead, we have the solution for you - and it’s free of nasty chemicals. Ovenu Mornington Peninsula is a locally owned and operated service that can restore your oven, range hood, cooktop and barbecue to near-perfect showroom condition. All products used by this health-conscious team are free of nasty ingredients. Ovenu technicians use an exclusive range of biodegradable, non-toxic, non-caustic products that are completely safe for you, your oven and your family - pets too. The technicians are fast, reliable and professional and can separate the glass panels in your oven door for a result you simply won’t believe. Kiss your unsightly Christmas residue goodbye by calling Nathan and Kim on 1300 683 681 for a quote, and a sparkling start to 2018. The $9.7 million refurbishment of St John of God Frankston Rehabilitation Hospital is essentially complete, with only some minor work remaining. The 12-month project, which was started in November 2016, has seen all rooms and ensuites refurbished, four new patients’ rooms built and an increase in single room capacity. 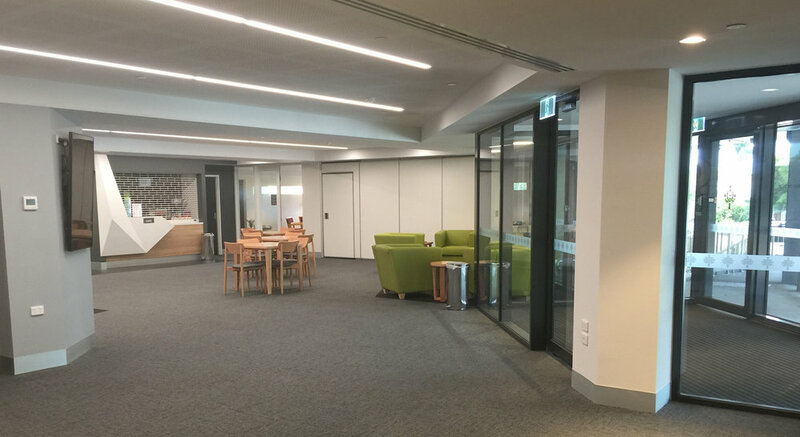 New spaces on the ground floor include an extended foyer with airlock entry, a new chapel, a multipurpose room, three new consulting suites and a café, while on the first floor the occupational therapy ADL kitchen, OT gym and pharmacy have all been upgraded. The ambulance entrance has been moved to a new undercover area at the rear of the hospital to improve traffic flow and ease of patient entry, while a new 17-tonne generator and upgraded airconditioning and plumbing are among the many mechanical and service improvements carried out behind the scenes. Access is incredibly important for a rehabilitation hospital, and new front and rear entrances will make this easier for patients as well as vehicles that transport patients after surgery or injury. “While this was a comprehensive and detailed refurbishment, it occurred in stages to minimise the impact on our inpatient and outpatient services. There was a buzz of excitement as each stage was finished and we are so pleased with the result. If you’re in the market for a bathroom makeover at an affordable price, look no further than Concept Bathroom Solutions. This family owned and operated complete start to finish bathroom renovations company produces some of Victoria’s best bathrooms on time every time. Your bathroom is a personal space in which to relax and rejuvenate. Concept Bathroom Solutions offers a professional service second to none, and you won’t have to break the bank to achieve the ideal space for you and your family to unwind and relax in. Function and aesthetics are key, and Concept Bathroom Solutions can guide you through the whole process from hardware selection to tile choice, shower screen and tub preferences. Then it installs them so you don’t have to. Concept Bathroom Solutions has been renovating bathrooms for over 23 years so you know the staff know what they are doing. Experience and reliability have secured their spot as one of Melbourne’s and the Mornington Peninsula’s finest providers of bathroom renovations. Call today for a free quote and see how Concept Bathroom Solutions can make your bathroom renovation easy.